BSBG Senior Structural Engineer Michael Gaspar delineates the finer points of a Tuned Mass Damper, which, particularly in Dubai, is imperative in providing comfort to building occupants; despite the majority being unaware of its existence. Contrary to popular intrinsic belief, skyscrapers and other structures do move to a certain extent. During seismic events or strong winds, the tallest skyscrapers can sway up to almost a metre on each side! The building may be structurally fine, but that magnitude of movement together with any induced vibration may cause severe discomfort, airsickness, nausea or even shock to the building occupants. Thus, lateral deflection (also known as sway or drift), vibration and building acceleration are significant criteria that structural engineers carefully assess in the design of high rise structures. There are several ways of reducing the sway and vibration of structures in order to reach the acceptable level of human comfort. First, vertical elements such as columns and walls may be stiffened by providing larger dimensions or thicknesses. However, architects usually prefer this to be the last option as far as is possible, so engineers may need to step back and look at more unconventional approaches; one of which is to “tune the building like a guitar”! Yes, you can fine tune a building, similar to everyone’s favourite musical instrument. How? The answer is through the use of a Tuned Mass Damper or TMD. What is a Tuned Mass Damper? 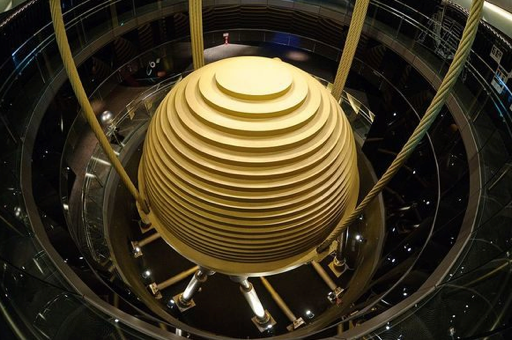 A Tuned Mass Damper (TMD), also called a “harmonic absorber”, is a device mounted to a specific location in a structure, so as to reduce the amplitude of vibration to an acceptable level whenever a strong lateral force such as an earthquake or high winds hit. There are two basic types of TMD; the Horizontal TMD which is normally found in slender buildings, communication towers, spires and the like. The other type is the Vertical TMD, which is usually applied in long span horizontal structures such as bridges, floors and walkways. Both types have similar functions, though there might be slight differences in terms of mechanism. How does a TMD work? The figure above illustrates a typical building without a TMD. When a lateral force (e.g. seismic or wind) hits the structure, the building will become excited and displaced (x1), generating kinetic force (K1) due to its mass and consequent acceleration. The building will then swing back to another displacement (x2) on the other side. In theory, x1 will be greater than x2 and x2 will be greater than the next displacement of the next swing (i.e. x3) which means there will be a time when displacement will soon come to zero. This scenario is due to the inherent damping ratio of the building. Damping ratio is a dimensionless parameter that measures how a certain oscillation subsides after a certain disturbance or excitation. The time it took for the building to complete one round of swing (left to right and then right to left) is the so called “time period” of the structure. This means the higher the period the longer it takes for the building to go back to its original position. This is where the feelings of discomfort come from, as the building occupants start to feel the movement due to the noticeable time span of building sway. This is one of the reasons why structural engineers pay attention to the period of the structure during analytical model analysis. Similarly, since frequency is the inverse of time period (1/s or Hertz, Hz), this means the higher the period, the lesser the frequency of the building and the more prone it is to uncomfortable building acceleration. Structural engineers also limit the acceleration of the building to an acceptable range, the exact value of which depends on the type of building occupancy (e.g. residential, office etc.). In theory, the main objective of a TMD is to act as a “counteragent” and absorb the kinetic energy (K1, K2) developed during building excitation. When the structure starts to sway, thereby generating the kinetic energy K1, the TMD is set into motion by means of the spring/pendulum and forces the building to the opposite direction by the counteracting force (D1). The same scenario happens when the building sways in the other direction (K2 vs. D2). As an effect, comparing the two diagrams above, it can be observed that displacements x1 and x2 for Schematic B are smaller than those of Schematic A. This result is due to the counteracting force offered by the TMD whenever the building tries to sway in either direction. This will also mean that the building will stop oscillating within a shorter time frame and will stabilise faster; a characteristic which structural engineers want to see in their serviceability assessments. To summarise, the main idea of the system is to match the frequency of the TMD to the inherent frequency of the structure itself, that is to say, if the structure’s frequency is 0.2 Hz for example, the TMD should be designed to a frequency that is exactly the same or close to this value, hence “tuned”. If this is achieved, then the TMD will be effective and the vibration of the structure will be controlled, likewise, acceleration will subside more efficiently. If not, then the structure may either be inadequate in serviceability when the TMD’s frequency is higher or may cause detrimental effects when the TMD’s frequency is lower than that of the structure itself. The animation can be represented by the below graph indicating the effect of TMD in controlling the vibration and acceleration of the structure. Notice the difference between the two acceleration graphs of Schematic A and B. 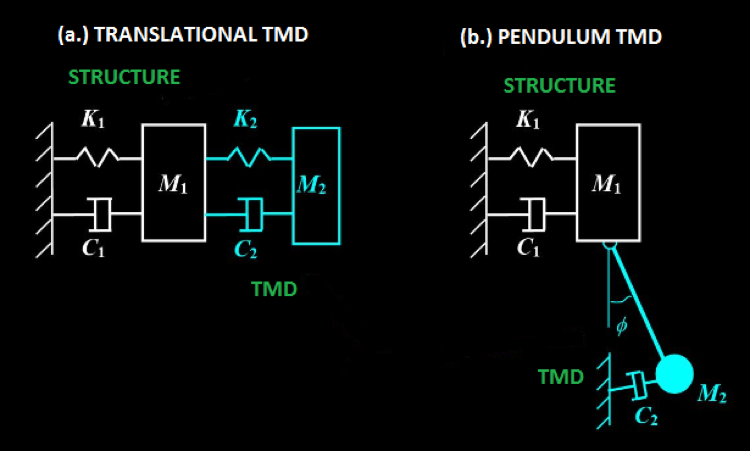 It can be observed that the initial and succeeding oscillations of the structure with a TMD are much lower than the other which doesn’t have one. 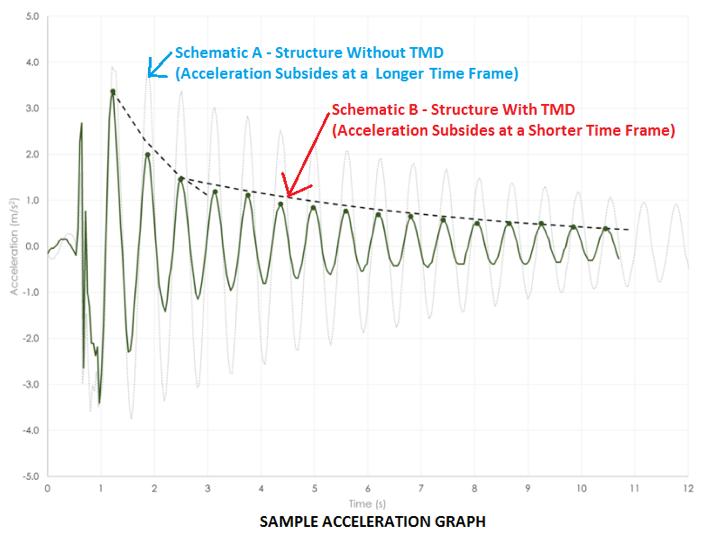 Acceleration with a TMD also subsides within a faster timeframe due to negating effect of the pendulum damper. The same theory applies in TMD’s in actual buildings and structures. When to use a TMD? 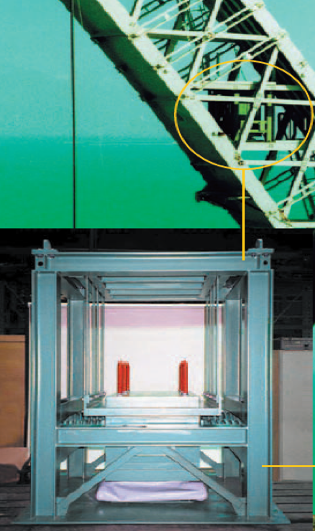 The good thing about a TMD is that it can either be included during the initial concept design of a building to reduce the size of vertical or horizontal elements (provided strength requirements have been achieved) or as a retrofit to an existing structure where vibration and acceleration issues are determined. Some of the major considerations that should be carefully assessed are its location and effect to space allocation; and cost comparison with and without a TMD. Nowadays, TMD’s are very much existent in every part of the world due to their notable efficiency and design flexibility. 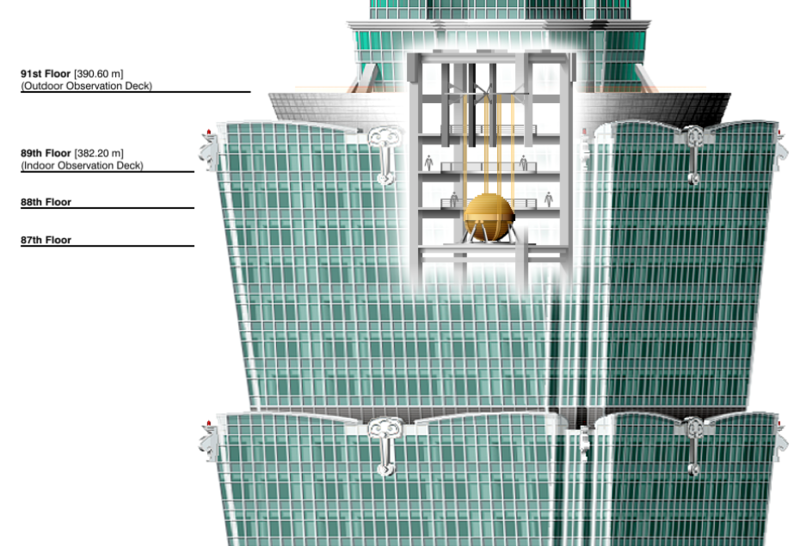 One of the most famous TMD’s is the one built for Taipei 101 which boasts a gigantic spherical Tuned Mass Damper weighing approximately 730 tons and costing around $4 million. Rather than hide the Tuned Mass Damper, which is the normal approach, the designers opted to make it a feature and open it for public viewing. 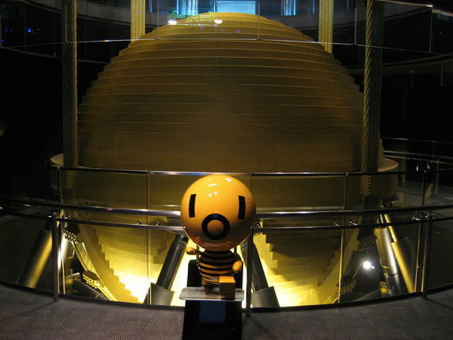 It has become a popular tourist attraction in Taiwan. The designers have decided to provide a TMD for Taipei 101 as the structure is only about 600 ft. from a fault line and the region is susceptible to strong typhoons. In fact, the spherical steel had displaced to a full metre swing to go against a 100 mph wind brought by Typhoon Soudelor in 2008. 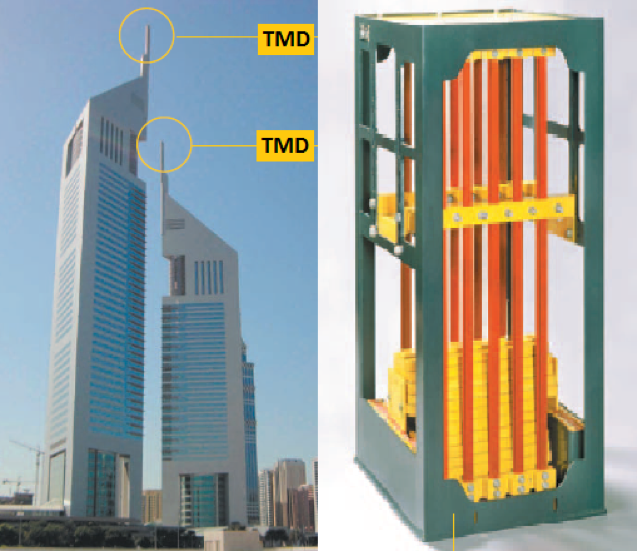 There are a number of famous structures in the UAE where TMD’s are adopted. One of these is the iconic 7-star hotel, the Burj Al Arab. We may never have seen this famous hotel exactly the way it appears today if not through the help of a TMD. Because of the building’s proximity to the sea and its geometry being susceptible to vortex shedding of wind, its exoskeleton bow features have been challenged by critically high vibration. The initial idea was to change the shape of the building, though the architect strongly refuted the proposal as it would be detrimental to the original conceptual image of the building. The issue was resolved through the use of eleven 5-ton horizontal TMD’s scattered throughout the external features of the building. Another well-known structure in UAE that uses the TMD would be the Emirates Towers near Sheikh Zayed Road. The towers have six 1.2-ton horizontal tuned mass dampers equipped on the top spires to control vibration due to slenderness. Tuned mass dampers can also be found in long span structures like footbridges in order to control vibrations due to foot traffic or walking excitation. Examples of these are the 0.75-ton vertical TMD’s of Capital Gate Tower footbridge in Abu Dhabi, which is designed to a 3.5 Hz frequency and the footbridge of Yas Marina Hotel, also in Abu Dhabi, which is equipped with 4 numbers of 3-ton vertical TMD tuned to a 1.8-2.7 Hz frequency. How about the Burj Khalifa’s damping system? The stability and efficiency against drift, vibration and building acceleration of the Burj Khalifa are actually achieved by the integrity of its structural system and its strategic shape, not by a TMD. The constant reduction in profile shape all throughout the building compensates the increase in induced wind pressure at a higher altitude. This strategy, together with its efficient wall system, are enough to stabilise the building against laterally induced forces. However, it cannot be discounted that there would still be certain areas where TMD aids have been applied, just not for the overall structural system of the building. The TMD concept is a discovery more than a century old, but it still plays in tune up to the present day. It is a simple yet efficient mechanism that when designed properly can offer significant benefits both for the owner and occupants of the building or for any structure where it is applied. 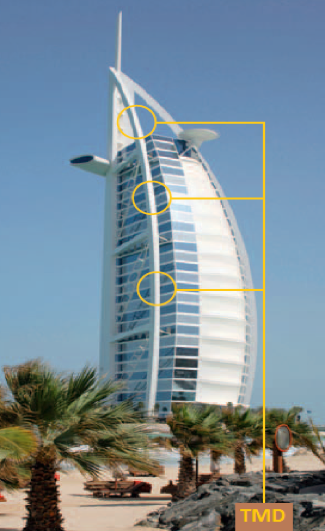 Case Study-Burj Al Arab/Chetna Shaktawat et. al.